Kofi Annan: Center of the Storm Detailed PBS profile. Includes interactive biography and map of Annan's worldwide travels, among other things. Requires Flash. 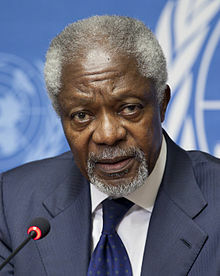 Kofi Annan: An Online News Hour Focus A compilation of information, interviews, and initiatives about and by Kofi Annan, by the website of the NewsHour with Jim Lehrer. From 1998–1999. Kofi Annan: Biographical Note Basic biography by Phyllis Bennis of the Global Policy Forum. One-on-one with UN Secretary-General Kofi Annan October 1998 interview of Kofi Annan by Kevin Chappell of Ebony. Ian Williams, The Guardian, 20 September 2005, "Annan has paid his dues: The UN declaration of a right to protect people from their governments is a millennial change"
Colum Lynch, The Washington Post, 24 April 2005, "U.N. Chief's Record Comes Under Fire"